When Tinder first came out just five short years ago, the app was a way to meet and possibly hook up with strangers. But somewhere along the line, this digital glory-hole has become a fucked-up chimera of harassment, alienation and dismal handjobs. Alternatives like Bumble and Hinge pop up but are unable to dethrone the inbred, hemophiliac king of dating apps that is Tinder. Be it lifestyle, preference or just plain unfuckable-ness, some people transcend the algorithmic categorizations of a regular dating app. Some people need something a little more niche to find love, or at least find someone willing to talk to them for an hour over coffee so they can lie to themselves about not being lonely. And based on my previous experience with dating apps, it seems that I fall into this category. Sometimes you need to travel to the dark underbelly of human interaction in the dim hope of human connection. With this, my journey begins. The first app I tried was called Spectr. I assumed it was a dating app for paranormal enthusiasts but it turned out to be a dating app where everyone intentionally ghosts each other. The journey was off to a bad start. The next app is called Munchee. 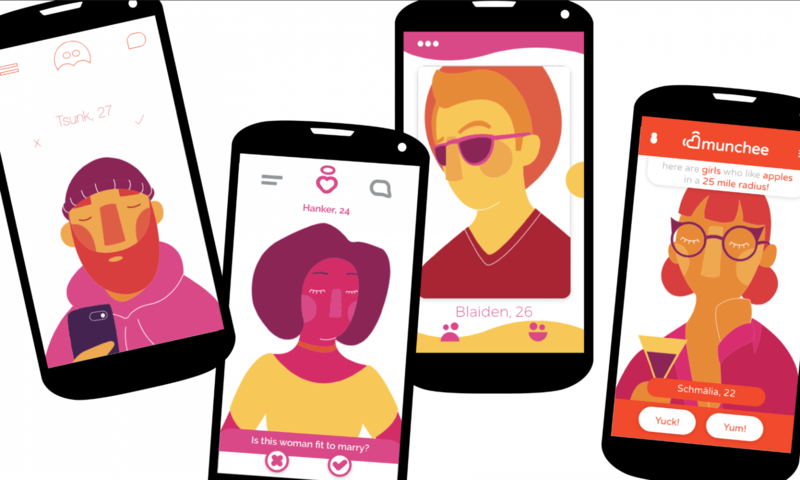 It’s an app that matches people based on their favorite food, which sounded pretty wholesome. After setting my age preferences (20 to 45) and my food preferences (anything with horseradish), I waited for a match. Surprisingly, I found one rather quickly. Her name was Martha, and she had a gaze that seemed to cry out “I also like horseradishes.” We connected and set up a date at Java's for later that week. Soon, it was date night. I was sweating — and it wasn’t just the many horseradishes I had eaten already. Suddenly, she arrived. Martha walked in the door, saw me, and didn’t fake a phone call to escape. This date was going perfectly. She sat down and flashed an award-winning smile. Like, a bronze, but a bronze in a respectable Olympic sport like tennis or skeleton. The mood immediately soured when I extended my arm for a respectable handshake greeting. She didn’t return the favor, and instead stared intently at my fingernails. I began to explain that I needed to keep them extremely long in case my flamenco guitar career ever takes off, but she wasn’t listening. Martha was a woman possessed. She closed her eyes and began to chant “Keratin is not that yummy/ it’s for my fingers not my tummy.” I decided it was best that I leave. After further research, it turns out that Munchee has a specific dating subculture for recovering fingernail-biting addicts within the app. It also turns out that “horseradish” was the codeword for said addicts to meet up with one another, and my long yet practical nails set Martha off. My bad, Martha. I was disheartened at this point. It seemed like no dating app would fit the bill. But faced with the prospect of talking to girls in person, I decided to double down on my efforts and expand my boundaries. While I wouldn’t usually download LDSwipe — I am not Mormon — I decided to keep an open mind. After hours of swiping, I matched with a girl named Emma. I imagined a wholesome, Mormon life together. Maybe in Utah, I don’t know. She recommended a tea house in the area, and we met up the next day. Emma was funny and sweet. Finally, a date that was going well. I reached down for my phone so I could text Mother the great news. As I drafted my message, I received a text from an unknown number. “Look up,” said the message. I looked up. There was no more Emma. There was no woman. There was only a shrouded figure whose face I could see but not perceive. The figure’s features slipped away into the void of memory where forgotten names and faces lie. It presented a mirror. To my horror, the mirror housed a distorted visage of myself, miserable and pallid. It was as if a caricature had come to life in high definition, every square inch as terrible as the last. I looked into my own flat, bloodshot eyes. They trapped me. It was only then that I realized that there was no distortion, that this horrible doppelgänger wasn’t a doppelgänger at all. The person in the mirror was me. Me as I looked to others, stripped of protective self-delusion. My hateful maw opened to scream but there was only acrid bile where sound once lived. My wretched body began to dissolve, molecule by molecule. I realized that I was simply a pixel in a cold black screen, and that my journey was but a hateful, commodified pastiche of genuine human connection. After an intense struggle, I freed myself from the mirror and ran out of the tea house into a dark forest, where nightfall came swiftly. I collapsed onto the ground, wet with snow’s afterbirth. This cold, dark eternity of mud was to be my final resting place. After hours of lying facedown in the forest, I realized that I wasn’t actually in a forest. I was in fact lying face down in the women’s restroom of an Arby’s. I checked my phone, hoping to find answers as to what just happened. Turns out I had accidentally downloaded LSDate, not LDSwipe. I should have been more suspicious when Emma ordered tea (Mormons don’t do that). Or when she made me eat that paper (Mormons usually don’t make you do that either). It would be reasonable for me to come to a conclusion like “dating apps don’t work for me” or “I need to seriously work on myself before trying to be in relationship.” But if I were someone who learned from negative reinforcement, I probably wouldn’t use dating apps to begin with. So I’ll keep swiping until I finally find love. Or like a casual dating thing. Or at least one of those dismal handjobs.